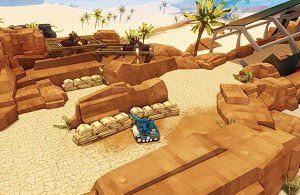 Tank’d is a free third person shooter developed by a group of students using the Unreal Engine, where the player controls a tank with a twist: the ability to drive on walls. This is a game with a quality similar to many indie titles, showing some flashy effects that will definitely catch your eye. The way that the tank drives up and down walls, defying gravity, provides a great additional layer of strategy to the arcade gameplay. Tank’d is a must play for all fans of great freeware PC shooters.